British Airways has now celebrated three years of its London City (LCY) – Kennedy New York (JFK) service. Inaugurated in August 2009 the twice daily (except Saturday) operation uses a pair of specially adopted Airbus A318 offering 32 lie-flat seats in a 2+2 configuration. It is a great way to fly to New York in spite of the Shannon stopover (see below). The return flight is non-stop, the Airbus not the quickest aircraft about, but any time lost over the Atlantic is made up by the usual ‘straight in’ approach and lack of taxiing when landing on the former quay. It is directly onto the apron for the aircraft, down the steps, through Border Control and away. Ten minutes maximum and a little more if you have luggage. Most business flyers only use a roller bag. Compare that with the struggle at Heathrow assuming you have not been held in the ‘hold’, or on the ground when actually landed. T5 is fine if you are into the main building but satellite arrivals mean up and down through endless escalators and waiting for the shuttle. And if you want the Underground it is back down to the basement again! I flew last week, outward bound over the Olympic Park, the stadiums filling up, and the park itself extremely busy, the people ants on a rolling landscape. Fabulous. The passengers seemed a very mixed bag. Business travellers appropriately dressed and others with more relaxed attire. One couple I spoke to were retired and off to New York for a holiday. They were trying the service ‘for fun’. It was ‘thumbs up’ as we got off. Another gentleman was based in Canary Wharf and Essex and said it was, for him, the only way to Kennedy. An American was trying it for the first time. The London City fare structure is the same as Heathrow and if it is the Avios scheme you use do get in as soon as the bookings open as the number of seats available is very limited. You can go one way Heathrow and the other London City. The BA ticketing is fully flexible. It all rather depends on where in London you originate and want to go to. The route is also an alternative to and from New York for many of the lesser mainland Europe airports not served directly but offering LCY services. It is far quicker to change at City than alternative airports. The service is a success, but for unusual reasons. Clearly it does not make any money but that is tiny in the scheme of things. It is a prestige operation that ‘flies the flag’. CAA statistics show a 12% increase in 2011 to 21,622 passengers which would indicate a two-way load factor in the lower 60s. There were only 20 of us on this flight. In total seven crew (see below) and a purpose-built aircraft, but managing a very healthy 4,500 hours per year with just three landings per day. 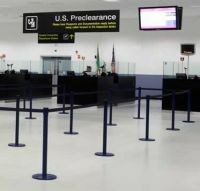 The stopover in Shannon takes about 30 minutes on the ground with a requirement to go through US Border Control within the terminal building. If you have hold luggage that must be claimed and nominally inspected. For whatever reasons the flight deck pair are rostered out of Heathrow and cannot make JFK within duty hours. It’s a Shannon stopover for them. The Gatwick-based cabin staff operate to New York. Shannon adds to the cost in terms of fuel burn. Once through the Shannon controls passengers are technically in America. One reason suggested for the controversial launch of the flights was to stop Air France (the world’s largest A318 operator with 18 in service since 1993 – BA have just the two) from introducing a CityJet service, which would have been an anathema to BA, probably losing Heathrow customers too. 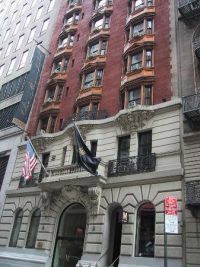 London City – New York is a very prestigious route, has excellent publicity value, and serves the Canary Wharf and east London market. Total flight time is scheduled as 9hrs 15mins, as against 7hrs 30mins from Heathrow, and a choice of two flights against eight (plus three to Newark). From say The Bank the airport journey time is 22 minutes with a service every 10 minutes. If you have strong nerves you can catch the DLR at just before 12:00 and be ready to get airborne at 13:00. Officially it is a 15-minute check-in. To Heathrow allow up to two hours by car and say a 30-minute taxi ride to Paddington and the Heathrow Express, or change at Holborn and take the Piccadilly line. Less pleasant but at 52 minutes probably quicker. But allow plenty of time for getting to the gate. London City Airport, following an extensive upgrading, former Director Richard Gooding’s final triumph, is very pleasant to use with a dedicated New York check-in and one of the best organised mechanised security operations around. One can visit the Duty Free and use the food outlets. 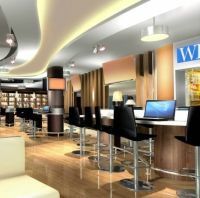 No executive club is provided as the airport is entirely wi-fi free and Gate 24, normally used, offers a range of snacks and drinks and then straight onto the apron and into the aircraft. It is all reminiscent of the old Concorde lounge ambience. The airport is at its quietest for the BA 001, lunchtime a real doddle. Not so the later departure at the beginning of the rush hour. Once on board the same atmosphere is retained, a sort of private members' club. Three staff are needed as unlike a normal narrow bodied aircraft with its pre-packaged meals on the BA 318 the three-course offering is plated and served with panache. Standard Club World. The 2+2 fully lie-flat seat has a re-set button. The seat adjusts for the ideal dining position, the button marked with knives and forks. Another unique oddity is a sign in the overhead panel which tells you when the mobile connection system is functioning. 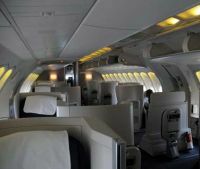 British Airways has not committed itself yet with in-flight connectivity. This, we presume, will wait until the arrival of the 787 and A380. In the meantime the A318 service has provided an excellent way of testing one possibility and a sales feature of the route. No huge financial commitment and clearly things have moved on in three years. OnAir have provided an SMS (text) and MMS (multi-media) system that links seamlessly with both Blackberry and iPhone hand-helds. You can link these into a laptop too, or use a dongle. Email could not be easier and is inexpensive. Text cost 50p per message and is free incoming. Surfing the web can be very expensive. BA, as a matter of policy, does not allow phone calls. For entertainment and information purposes iPads are supplied, very easy to use, sitting comfortably on the cocktail table provided. There are not many places to put things but a newspaper storage bin is provided. There is a loo at either end and a cleverly integrated crew rest area. BA 001 (13:00 with 9hrs 15mins total time) arrives at 17:15 local in the middle of the rush hour, both at the airport and on the road. It is something of a maze going through T7. You are in Domestic. 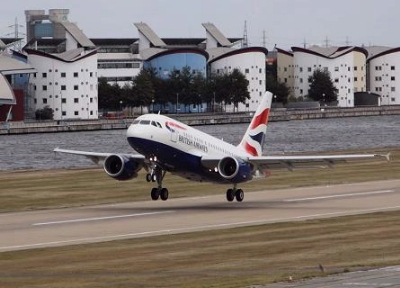 For BA 003 (16:00) London City is much busier, but arriving at 20:20 one should find both the airport and roads quieter. Passengers inbound from New York are particularly well looked after. The 19:10 arrives at 07:15 and 09:50 at 10:00. If your needs are such there is a courtesy chauffer service to the nearby riverside Radisson Blu (Edwardian) where you can take the complimentary breakfast and make use of the spa facilities. For the future the service is clearly here to stay but any further Westbound services are unlikely. Even Concorde to Washington did not survive a cull. It seems to me that BA will continue with the operation and might look seriously at the new Bombardier C series due to fly by the end of the year. This is designed for London City Airport operations with a 40-passenger load out of City non-stop to New York. Other long haul destinations could also be introduced. The only problem is that Lufthansa, another LCY stalwart, has it on order. Interesting times ahead. The journey back was just as appealing in the ‘bubble’ of a BA 747. Here you are again in a sort of private members' club, 20 passengers maximum, a slightly wider aircraft, BA choosing to offer 2+2 with the seats reversed in pairs, enabling the clients to get in and out mostly without bothering anyone. There is an electrically operated screen in-between allowing you to converse with your neighbour, or ignore them. 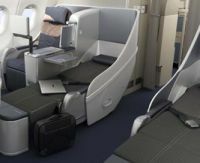 The window seats become private suites, better than some First Class, with the low level storage box retained. Downstairs the arrangement is eight across, 2+4+2. The centre seats are set in pairs enabling two people to sit together. The seats look narrow but in fact were very comfortable. One loo and two staff for this journey. I chose to come back on the daylight flight which means an early start in Manhattan for an 08:00 departure from T7 once again, in the early hours much quieter. I also paid £80 for a pre-booked seat upstairs (£65 in the main cabin) rather than take a chance when the full seat allocation opens 24 hours before departure. The BA lounge is available (don’t be mislead by the website which has got it wrong) but full dining facilities are not provided. Nor at this time the Spa. There is a further seven Heathrow departures from 18:50 onwards when everything is available. You can link your own device to the courtesy wi-fi or use one of the BA screens from the large bank provided. Assuming you are upstairs in the Jumbo it is in some ways more pleasant than in an A380 with the wide-bodied Business Class cabins. Lufthansa now has the Dash 8 version of the Jumbo, and also the Airbus. If that airline does carry out a passenger survey it is unlikely that the results will be published. The updated 747 is likely to be quieter than the existing aircraft. Nice to tell people at a dinner party that one has flown Concorde Class. But London City to New York is very good. I used the services of Business Taxis (they also trade as Holiday Taxis) booking service for this trip at the New York end and found it first class. It is lovely to be greeted with a friendly face upon arrival (and unlike Heathrow T5 faced with perhaps 75 bored drivers looking for their clients – surely BAA can institute a better electronic system) and then whisked in a Mercedes S class to Manhattan. Since it is a fixed price the driver chooses the route. I was taken past Flushing Meadow and the tennis, and La Guardia. Few traffic hold ups in the middle of the rush hour. With a collection at 5:30 getting back to T7 was no problem, and turning left once into the building the Club World check-in could not be quicker. For reasons best known to themselves BA’s web site suggests that the Terraces Lounge only opens at 08:00 which is not true. However at six in the morning the service is limited, the excellent dining facility not open until later, nor (sadly) the Spa.